As an ordinary citizen, I have seen that the Standing Committee of the National People’s Congress has publicly requested opinions on draft legislation for amendments to The People’s Republic of China’s Criminal Procedure Code. Paragraph 30 of the amendment stipulates that public security organs can, under special exceptions, set up a place for a suspect to live under surveillance without notifying the family. Paragraphs 36 and 39 stipulate the special exceptions in which arrest or detention by public security organs can take place without family notification. This means that a Chinese citizen cannot have protection of his or her most basic rights. Residential Surveillance [originally conceived as house arrest] thus becomes secret detention, this is a blatant violation of the constitution. I ask the National People’s Congress, when you debate paragraphs 30, 36 and 39 of the amendment, not to pass the special exemptions. In this way you can clearly state that when public security organs take up forceful measures of detention, arrest or surveillance against any citizen, they should notify the family without exemption and within the period stipulated by law. My name is Lu Qing, citizen of China, I am a painter. My husband Ai Weiwei, artist, architect and participant in civil society, designer for FAKE Cultural Development Ltd., was taken away at customs at Beijing International Airport. He disappeared for 81 days. We did not receive any notification from the authorities. We did not know why he was kidnapped, where he was held, or about his health condition. Family and friends were all very worried and angry about his disappearance. Ai Weiwe’s mother, who is over 80 years old, worried day and night. She could hardly sleep or eat and had to take medication. It was a huge mental and physical strain on her. Family members have tried to get information from any direction, reported the case at police stations both where he disappeared, where he had lived and where he was registered. 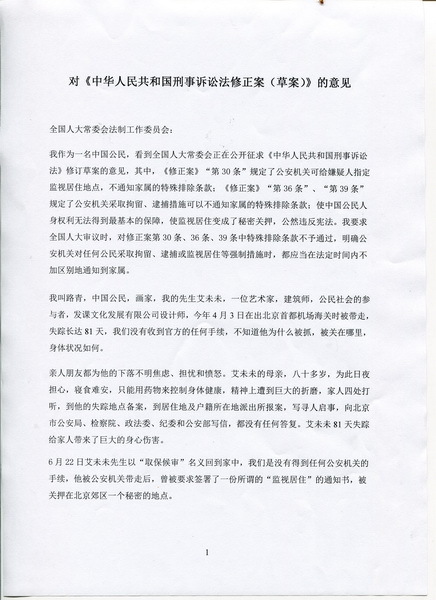 We wrote Missing Person ads and sent letters to the Beijing City Police Bureau, the Procurator’s Office, the Politics and Law Commission, the Discipline Inspection Commission and the Ministry of Public Security, without receiving any answer. Ai Weiwei’s disappearance for 81 days was very harmful for the physical and mental state of his family. On June 22, Ai Weiwei was “released on bail to await trial” and returned home. [Again], we have not received any notice from the public security organs. 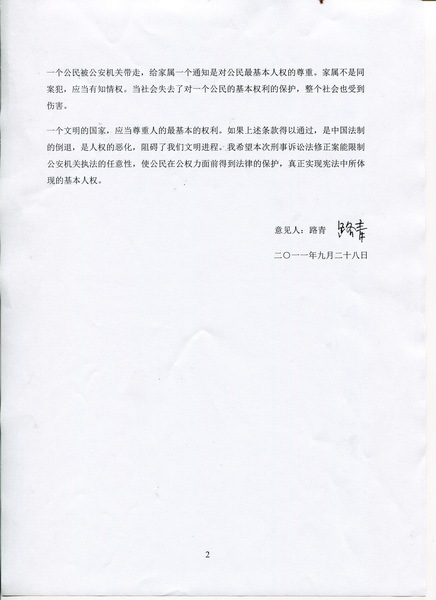 After he was taken away by public security organs, they demanded he sign a notice about “residential surveillance” before they brought him to a secret place in the outskirts of Beijing. When a citizen is taken away by public security, the family should be notified, to honor one the most basic human rights of a citizen. Family members are not co-defendants. They should have a right to know. If a society loses the protection of a citizen’s most basic rights, this is harmful for the whole society. A cultured nation should respect the most basic rights of a person. If the above measures are passed, it will be a regression for China’s legal system, the deterioration of human rights, and will be a hindrance to the progress of our civilization. I hope that the current modification of amendments to the Criminal Procedure Code could restrain the arbitrariness the public security organs display in upholding law and order. I hope that citizens receive legal protection before the arm of the law, so that the basic human rights as they appear in the constitution are truly recognized. You are currently browsing the 中国大好き blog archives for 2011年9月.